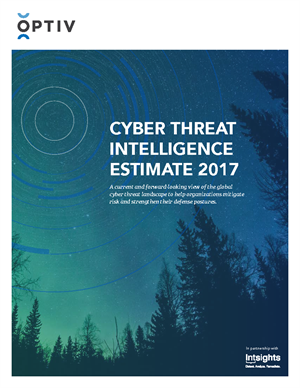 The 2017 Optiv Cyber Threat Intelligence Estimate is part analysis and part forecast. The analysis portion dissects the security themes seen in 2016 while the forecast extrapolates the analysis through the subsequent 12 months. This is modelled after the National Intelligence Estimate, which is a classified report provided to the Congress of the United States.